The 2018 International Energy Outlook report produced by the U.S. Energy Information Administration examines the linkages between economic growth and global energy markets. In particular, it performs case studies on three areas of the world experiencing fast growth under different developmental models—China, India, and Africa—to understand how their energy demand and consumption will change under varying scenarios of economic growth. It predicts that energy consumption will likely rise as a consequence of accelerated economic growth and an increase in production and manufacturing, prompted by the growing demand for goods and services. In the case of Africa, the report discusses how regional comparative advantages, such as low cost of labor and natural resources, will lead to growth in Africa’s manufacturing sector as the region’s economies continue to grow, and in turn, will increase demand for industrial energy use. 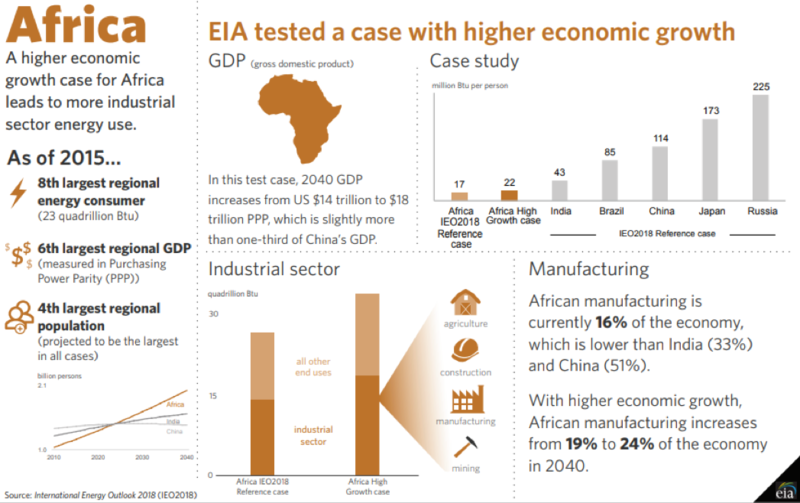 Under a base scenario (the Africa IEO2018 Reference case) in which the region experiences 3.8 percent annual gross domestic product growth from 2015 to 2040, the report predicts that the region’s GDP will reach $14 trillion in 2040, and manufacturing will account for 19 percent of the economy, up from 16 percent today. However, under the assumption of higher economic growth for Africa (the Africa High Growth Case)—in which the continent experiences 5 percent annual GDP growth from 2015 to 2040—GDP is expected to increase to $18 trillion in 2040, and manufacturing will reach 24 percent of the economy (see Figure 1). Furthermore, under the high growth scenario, average African energy consumption per person in 2040 is expected to be 30 percent higher than under the base scenario, reaching 22 million British thermal unit per person, although this level is still below consumption levels seen in emerging markets such as India and Brazil. Total delivered energy consumption in 2040 is projected to be 22 percent higher under the high growth scenario than under the base scenario, with the industrial sector driving over half of the increase. Meanwhile, rising per capita income is expected to influence non-industrial energy use, due to rising consumer demand for goods (such as appliances and cars) and services (including hospitals and shopping centers). Moving forward, the report suggests that energy consumption per capita in Africa could fall behind that of other regions, as its population is expected to grow faster than energy consumption in the region. Yet, improvements in infrastructure—namely transport networks and electricity—could accelerate future energy consumption.